Very little is known of the participation of the exiled Tibetan during the 1971 liberation war of Bangladesh. Almost 47 years ago on a cool and scary November 14 night in Chittagong a Pakistani sniper of Special Service Group perched silently on his hidden location near his camp felt he saw a ‘phantom’. The days were then uncertain, and nights were too risky. The Pakistani soldier did not take any chance and opened fire. And the shadowy figures melted away in the darkness. One was shot at fatally. The Pakistani soldier did not know that he had just killed one of the toughest CIA trained Tibetan guerrilla leader — Dhondup Gyatotsang, a Dapon or Brigadier in Tibetan language. The guerillas, all armed only with Bulgarian AK 47 (instead of Russian make) and their Tibetan knives, made radio contact with a turbaned Sikh commander across the border. The Sikh barked at them an order to carry on with the task they are assigned to. As the order came the Tibetan commandos once again spread in the darkness and coiled up behind the Pakistani barracks and nests. They remained as shadows as long as they wanted and when the right time came they just struck with lightning speed raiding the well-guarded Pakistani military positions in occupied Bangladesh. One after another Pakistani positions fell as the Tibetans, who by this gained the title ‘Phantoms of Chittagong’, swept the valleys of the hill-forest of Chittagong Hill Tracts. Weeks before the formal India-Pakistan war broke out on 3rd December of 1971, the Tibetan guerrillas turned CHT into a virtually a free zone with pre-emptive strikes for Indian army movement. 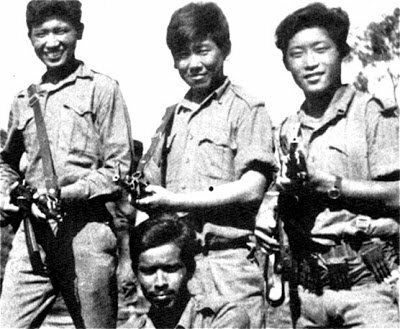 On December 16, when the Pakistani army surrendered, the Tibetan commandos were only 40 km from the Chittagong Port. By this time, they had successfully accomplished the task that their chief, General Sujan Singh Uban had assigned to them: The Operation Mountain Eagle. The Phanton Warriors, lost 49 (according to Tibetans’ estimate 56) of their comrades, including their commander Dhondup Gyatotsang, and had 190 injured. Their sacrifice was never officially or publicly recognised — neither by India nor by Bangladesh. ‘Operation Mountain Eagle’ launched in CHT during 1971 war was, the most closely guarded covert operation of Indian military regime in the eastern war theatre. Officially the operation was known as Special Frontier Force (SFF) or Establishment 22 or simply called ‘two-two’ — does not officially exists in Indian military war history. Fortunately, Gen. Uban was entrusted with the overall task for training of the Bangladesh guerilla forces like the Mukhti Bahini and Mujib Bahini. Uban did not miss the chance and moved New Delhi to send his Tibetan forces to Eastern War Theatre – Bangladesh. After initial hickups, the Indian Prime Minister Indira Gandhi agreed to use the Tibetans but sent the ball to the court of the Tibetans. In third week of October 1971, the top-secret armed campaigns against the Pakistan army in East Pakistan, the Operation Mountain Eagle, was quietly launched. More than 3,000 Tibetan commandos from Establishment 22 were dropped at an obscure and extreme border village Demagiri in Mizoram, located across the river Karnafuli in Chittagong Hill Tracts, where the place was crowded with war-refugees from Bangladesh. In the second week of November 1971, the Tibetan guerrillas led by Dapon Dhondup Gyatotsang crossed the river using nine canoes and penetrated deep inside Pakistan frontier to launch a decisive guerrilla campaign. The task to Establishment 22 was clear: blow up Kaptai dam, damage the Pakistani military positions and kill as many enemy troops (nicknamed Khan Sena) as possible, destroy the bridges, military infrastructures, and restrain the Pakistani military movement. Within one month of their operations, the Tibetan guerrillas virtually cleaned up the Hill Tracts. When the Indian army moved into Hill Tracts they did not face much resistance at all. The Tibetan’s successfully restrained them in their respective positions and also blocked a potential escape route into Myanmar for Pakistani 97th Independent Brigade and 2nd commando battalion of SSG, were positioned strategically in Chittagong region. As they did not exist officially for the India government, nobody could be decorated. However, some brave heart Tibetan commandos were awarded cash prizes by the Indian authorities. Nothing more, nothing less! Saleem Samad is an award-winning investigative reporter and recognised as an Ashoka Fellow (USA) for agenda setting journalism in 1991 and a recipient of the Hellman-Hammett Award recipient (2005). He is a correspondent for Paris based international rights organisation Reporters Without Borders (RSF) and a pro-bono contributor to CPJ and IFJ.